About Warsaw In Your Pocket City Guide | What is Warsaw In Your Pocket? What is Warsaw In Your Pocket? 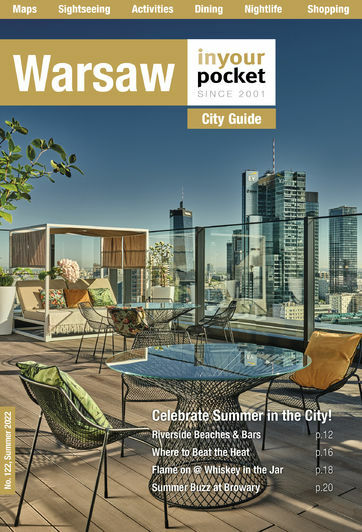 Warsaw In Your Pocket is the best guide to Warsaw and the surrounding region on the market. Written in a witty, impartial and informative style, here you'll find almost limitless amounts of info on what to see and do while in town, plus all the history and cultural background you could possibly wish for. Best of all, the information we give here is meticulously updated every two months so that it is as current and accurate as we can possibly make it. Even more importantly, the editorial content of In Your Pocket guides is completely subjective and independent of paid-for editorial or sponsored listings. Contrary to whatever you might think, IYP writers do not accept free meals, sexual favours, first-born children or other bribes in return for favourable reviews, and we reserve the right to say whatever we damn well please about the venues listed in our guides, regardless of disagreement from partner clients, restaurant owners or the general public. Our researchers and editors also do everything in their power to ensure and maintain the accuracy of the information imparted here, but it’s a tall order, and IYP assumes no responsibility for errors, American spellings, poor service, surly doormen, unexpected pregnancies, disappointing food or terrible hangovers experienced by our readers. For more info on what we do and all we offer, visit our company website: iyp.com.pl. For advertising inquiries, contact Jarosław Śliwiński: (+48) 606 749 643. Or cyber-snail mail us via poland (at) inyourpocket.com. Current editions of our full print guide can be ordered from our online shop, or picked up in person at most tourist information offices and hotel reception desks in Warsaw. Download a free pdf of the current print edition of Warsaw In Your Pocket. Look inside our latest print editions on Issuu, or via the Issuu mobile app (Apple, Android). Explore and experience a curated selection of essential sites in Warsaw, or browse dozens of other In Your Pocket cities, using our free mobile application. Search and explore our complete and unabridged online database of everything there is to see and do in Warsaw. If you dig our Warsaw guide, check out our guides to Kraków, Gdańsk, Wrocław, Łódź, Poznań and all the other Polish cities under our loving scrutiny, or any of the almost 100 additional cities covered by In Your Pocket. To keep abreast of what's happening in Warsaw, follow our blog and find us on Facebook, Twitter, Instagram and Tumblr.